Helicopter Technik München HTM Skyrider D-HTMS. 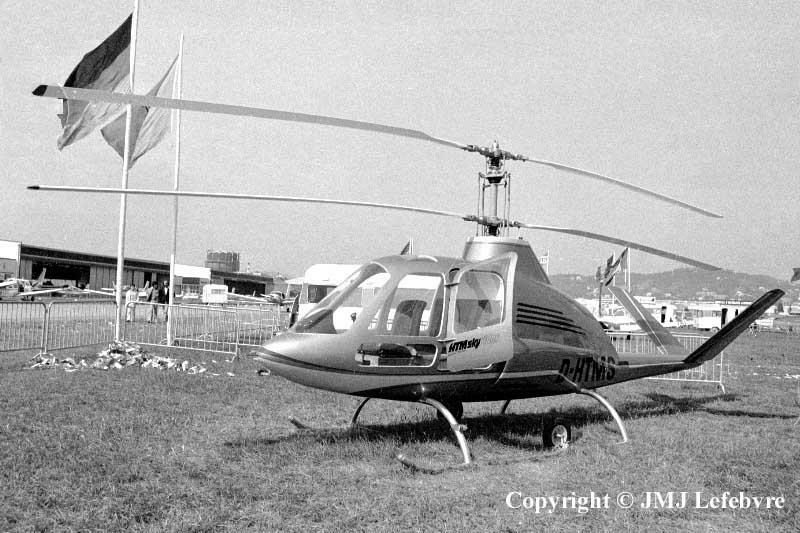 Helicopter Technik München, evolved this sophisticated version of the Skyrider from Vogt design for a light helicopter powered originally by a rotative Wankel derived from the car engine. The first rustic Skyrider finally was the object of successive refinements to be finally powered by a Lycoming flat-six engine having a vertical shaft to power rotaries and appear as a very pretty machine. At the time of the 1972 Cannes exhibit, the Skyrider under this form had never been flown and this D-HTMS went in the air later. The contra-rotative twin-rotor of a 10,4 meters span with a disc surface of 84,9 square meters permitted to avoid use of a tail rotor and build a low conical rear beam wearing a V-shaped tail, fuselage length being 7,43 meters. Maximum weight was 1500 kg for an empty frame of 933 kg. With an accomodation of four the Skyrider was capable of a maximum level speed of 190 km/h, cruising speed establishing at 170 km/h with a range of 7OO kilometers. Oblique climb was 7,5 meters per second, vertical one being Just 2 meters by second for a service ceiling of 3000 meters.